Vauxhall Astra J VXR 2012 on Scorpion Exhaust 3 Secondary Cat-Back System (Non-Resonated) Special SVXS057. Each exhaust is British manufactured, hand made in Derbyshire by the same technicians who create factory systems for the highest profile race series on the calendar, including the British Touring Car Championship; and each is bristling with race proven technologies transferred directly from the track to your road car. We call this' Red Power'. As Scorpion exhausts are produced in batches we aim to stock as many products as we can at any one time. With the factory providing the world stock there can be a time delay in products being required and manufactured. Please refer to the product details below to help you in ensuring this Scorpion product is correct for your vehicle. Yes Product Specific Description: The latest VXR is pretty awesome in standard trim however the Scorpion development engineers have been busy to improve on this. This time coming up with a 76mm / 3 Half System with either Resonated or Non Resonated centre section. This is further expandable to include a down pipe fitted with Sports Catalyst. The sports cat is a 200 cell high flow unit. A De-Cat down pipe is a further option. All postcodes in England and Wales. To be sure of the correct fitment, please use the further specification data above to assist you. Benefits of a Scorpion Exhaust. Precision engineered for an exact fit. Hand crafted exhausts made in the UK. Technology transferred from the track directly to your road car. Diverse Product range from Cars to Motorbikes and ATVs THE ENTHUSIASTS BRAND Thanks for your interest in the Scorpion brand. Whether you invest or not, it's great to have this opportunity to tell a little of the Scorpion story and why we have become known as, the enthusiasts brand. In todays ultra-competitive environment, it's important we anticipate your needs and surprise you with a constant stream of great ideas which are relevant for the way you ride and drive. And in order to do that we should have not just an understanding - but a passion - for bikes and cars. Those who have made the trip through Derbyshires countryside to our manufacturing facility will first be struck by the rows of performance bikes and cars lined up outside. These are not customers vehicles, but staff - designers, motorsport specialists, engineers, R&D technicians and road testers. All automotive enthusiasts, all ultra professional yet very approachable people who all follow the same Scorpion philosophy - that only by knowing our customers and their needs well, can we deliver exceptional user experiences. Peer into the works and you will see individual customer exhausts being crafted by automotive engineers, and quality control technicians checking every component that goes out through our doors. The teams meticulous attention to detail and superior engineering skills put Scorpion at the very top in terms of construction quality and reliability. But the real difference is the way a Scorpion feels. No other exhaust feels like a Scorpion because no other exhaust is created with our passion. And that's one thing which can never be copied. ARE YOU READY TO EXPERIENCE RED POWER? Red Power is something which can't be seen or touched nor is it a statistic on a piece of paper; its how ownership of a Scorpion exhaust makes you feel, how a unique synergy of construction, aesthetics, performance and sound is delivered. Red Power evokes the passion, performance and heat of competition drawn from over 20 years of motorsport tuning and racing success. It embodies the drive of Scorpion for continuous engineering superiority, product and performance refinement, and above all sheer riding and driving enjoyment. Red Power also gives you the comfort factor that the system you have specified has been hand crafted by a Scorpion automotive engineer in the UK - not mass produced in the far east like many of todays most expensive brands whose popularity is simply the result of paid endorsements, media manipulation and advertising hype. Scorpions hand built systems not only give you real exclusivity, but added value too. It is not just about charging what we feel the market will stand for a premium grade exhaust; when you upgrade to Scorpion you are paying for quality R&D, the finest hand selected materials, extensive testing and for the skill of an automotive engineer. You really are getting more bang for your buck. Red Power is even built into the product itself, a select number of systems featuring Red Power tip inlays to distinguish our special products - a unique way to identify Scorpion from the rear; the only view other traffic (or race competitors) usually get of a moving vehicle. For them the message is clear: Back off, or get Stung! THE ORIGINAL SPORTS EXHAUST Scorpion have been quietly winning motorsport championships for over 20 years, consistently beating teams which are very publicly supported by rival exhaust manufacturers who construct entire marketing campaigns around their racing involvement. Those who follow motorsport may have seen our support team in attendance at a huge range of two and four wheel series - without even knowing it. Often in sponsors team attire, Scorpion factory technicians are focussed purely on the racing and our involvement has always been strictly for development - not promotional purposes. The same discretion has been applied supplying OE systems to some of the worlds biggest supercar manufacturers who have chosen Scorpion exhausts to put their name to. As Scorpion moves into a new era the intention is to adopt a higher profile with our motorsport program, especially production based series which give us the most relevant development environment to allow true technology transfer from track to road. In particular we intend to build on successes in the BTCC, Porsche Cup, VW Racing Cup, World Endurance, Time Attack and Superbike; plus off road sport including Rally, MX and Supermoto. 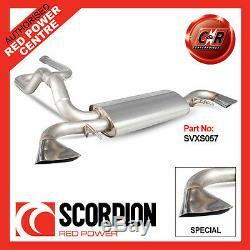 We Also Sell Scorpion Exhausts For Most Other Makes Of Car. C&R sell an extensive range of replacement and High Performance parts for your VW, Audi, Seat and Skoda. Stocking only the Highest Quality brands such as: K&N, Black Diamond, Goodridge, Piper, Kent, Jetex, Superpro, Powerflex, Prothane, Vibra Technics, Redline, Eibach, Koni, Scorpion and Weitec. We're not just "box movers" we are able to offer in depth technical advise relating to the product or we can provide a fitting service on most of the VAG Group parts we sell in our Nottingham workshop. C & R Enterprises The Volkswagen, Audi, Seat and Skoda Specialists. The item "Vauxhall Astra J VXR 12 on Scorpion Secondary Cat-Back (Non Res) Special SVXS057" is in sale since Sunday, April 17, 2016. This item is in the category "Vehicle Parts & Accessories\Car Tuning & Styling\Performance Exhaust\Complete Performance Exhausts". The seller is "candrenterprises1" and is located in Nottingham. This item can be shipped worldwide.